Tree Health And Wellness Ashburn: What Does A Tree Surgeon Do? If you’re sick, you go see your primary care physician in Ashburn. If you realize that you’re suffering from an internal injury or illness, you book an appointment with a surgeon who has the skills necessary to help you get better. People aren’t the only ones who can get sick and need a doctor, of course. We take our pets to see veterinarians when they’re in need of professional care, and when it’s your tree that’s sick, you call a tree surgeon. Many people often ask us what it means to be a tree surgeon and what we actually do, so we decided to explore the topic in a blog! Keep reading to learn more about how we work to preserve tree health and wellness in Ashburn, and contact us immediately if any of your trees seem sick! 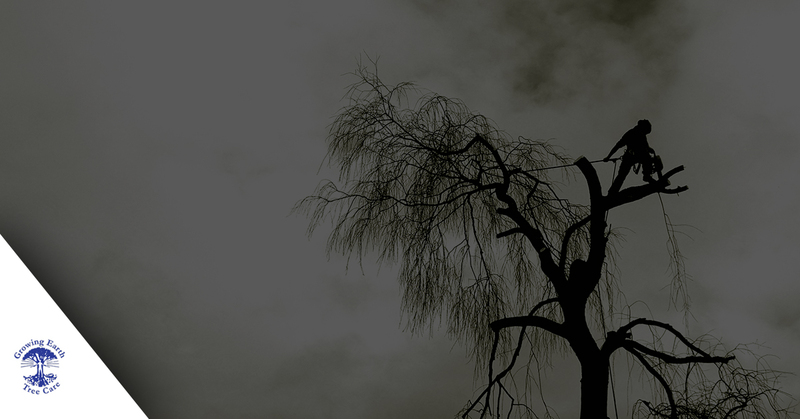 As we mentioned previously, trees can contract diseases or suffer injuries much like people do. Without the proper care, these health and wellness issues can have a negative affect the appearance and longevity of the tree itself. These issues include pest infestations, fungal infections, bacterial infections, natural and human-caused damage, chemical and weather burns, and soil problems. When you talk about tree surgeons, you’re actually talking about horticultural maintenance professionals known as arborists. These tree service professionals have gone through years of education and on-the-job training to be able to diagnose, heal, and maintain trees. Growing Earth is one of the few local tree service companies to be accredited by the Tree Care Industry Association and a member of the Certified Arborist Association. Many people refer to us as tree surgeons because of the precise way that we can trim and prune a tree for maximum wellness. In most cases, a tree surgeon is called to a property when trees need to be felled, shrubs or branches need to be pruned, logs need to be split, fallen trees need to be moved, and new trees planted in their place. To be an arborist and tree surgeon is actually a very exciting job. We spend a lot of time up in the branches of a tree or digging around near their roots. We especially love planting new trees, as we’re aware of the vital role that they play in our healthy ecosystem. In order to become a tree surgeon, it’s necessary that you have expert proficiency with power tools and the other dangerous equipment that we often have to use while suspended high up in a tree (and sometimes just the air!). It’s also necessary that you have an extensive knowledge of tree species, their growing patterns, proper trimming and pruning techniques, and the warning signs of disease or pest infestation. Contact Us For All Your Tree Health & Wellness Needs In Ashburn! If you’ve never had a tree surgeon visit your property and make a full inspection of your trees, now may be the best time to schedule an appointment. If you’ve noticed that one of your favorite trees isn’t looking as healthy as it once did, it’s even more important that you call our tree care company today.